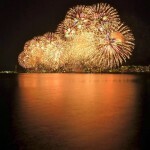 The Sumida River Fireworks Festival is an annual fireworks event, held on the last Saturday in July. 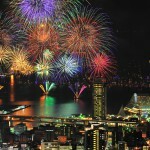 It is also one of the most famous fireworks festivals in Tokyo. 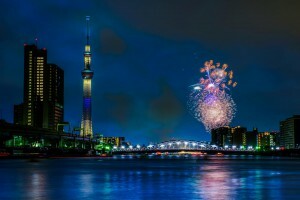 The festival is held at two sites along Sumida River. The festival is will still be held in case of light rain but will postpone due in case of bad weather. Tens thousands fireworks are released in two close areas. You can enjoy watching beautiful fireworks and seeing fireworks lighting up the night sky and its reflection on the water surface. 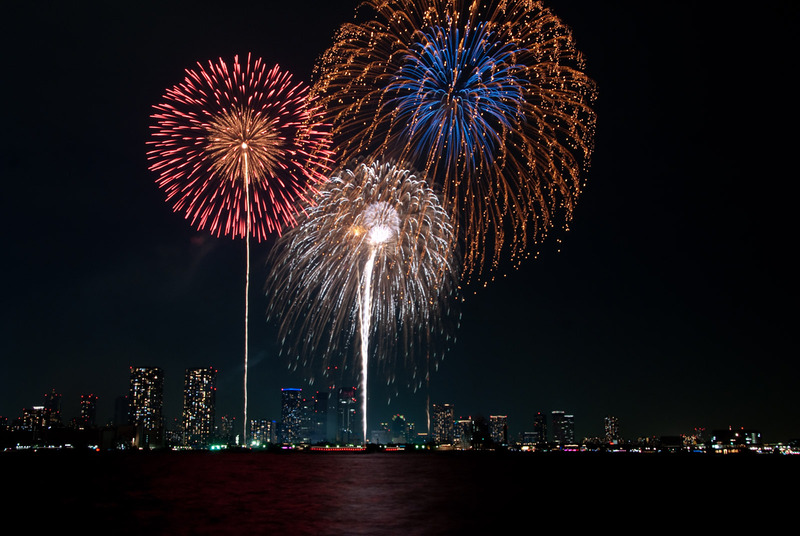 There are also irregular or complicated forms of fireworks, such as Japanese anime characters as well as fireworks of various colors or patterns. Millions of people come to see the fireworks on the day, to which many people arrive since the morning. If you want to get the good-viewing spot and do not want come to the venue very early, we recommend you to reserve the paid seat in advance. Applicants will be selected by the lottery if number of applications exceeded the limit. You cannot get a refund for seat fee when the festival is postponed due to the bad weather. Venue No.1 Seat: JPY 6,000 (about USD $48.4) If you win in the lottery, you can invite five or fewer people for free. Venue No.1 Seat (party): JPY 24,000 (about USD $193.6) If you win the lottery, you can invite 22 or fewer people for free. Venue No.2 Seat: JPY 5,000 (about USD $40.3) You can apply four times but if you win the lottery, you cannot invite anyone. Applicants will be selected by the lottery if number of applications exceeded the limit. You can watch and enjoy fireworks on the ship with meal. Only for a group consist of 10 ~30 people. If you want to see fireworks on the ship, please contact us. If you want to get more information about hotels, please contact us. 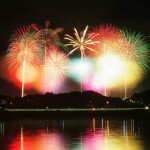 ・Aside from the paid seat area, do not stop and stand to watch the fireworks. People are walking while seeing the fireworks. Experiencing Japan through Flower Arrangement!